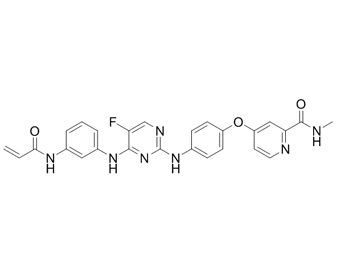 CNX-774 is a potent Btk inhibitor (IC50 < 1 nM). Recently Bruton's tyrosine kinase (BTK) , a crucial terminal kinase enzyme in the B-cell antigen receptor (BCR) signaling pathway, has emerged as an attractive target for therapeutic intervention in human malignancies and autoimmune disorders.
. Akinleye A, et al. Ibrutinib and novel BTK inhibitors in clinical development. J Hematol Oncol. 2013 Aug 19;6:59.